The Parkclaw has set new standards in terms of cross-terrain shoes. The Gore-Tex version enables you to mix and match road, trails and parklands while also keeping your feet dry. 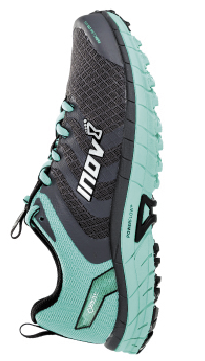 Designed for paths and trails rather than mud, the shoes have the standard Inov-8 Met-Cradle technology to hold the midfoot stable, but are much wider in the toe box, compared to the more familiar Inov-8 fell shoes. This gives a little movement on really technical terrain, but the sticky rubber means they’re great on wet rock. The softest of the Gore-Tex support on test helps make for a responsive feel, with decent flexibility, especially on steep hills. as you’re OK with the stiffness of the outer. Verdict: Stiff, but good for logging the winter miles. If you need a good all-rounder to cope with rocky, muddy, wide, singletrack trails, as well as some bits of road, then the Caldorado is a good place to start. The grip is good, helped by multi-directional lugs, while the fit is reasonably roomy with a broad forefoot, so there’s the potential for slippage on steep contouring. That aside, the shoe flowed well and gave a feeling of confidence when descending technical trails. 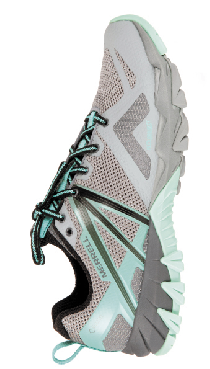 The Outdry upper (as opposed to the others on test, which are Gore-Tex) means this is by far the most flexible shoe, but still one that gives a well-cushioned ride, and, with an 8mm drop, makes you want to run fast. Verdict: Comfort for miles on any trail surface. Merrell sells this as a hybrid trainer for moving quickly in the mountains, mixing walking and hiking. With quite a wide fit and a low drop (3.5mm) the MQM is fine for moving fast with the occasional jog, but doesn’t have the ride or cushioning you would want for pure running. It’s fine for short bursts of running, but best kept for hiking and some scrambling. Think rugged conditions and you'll have the type of terrain and weather this shoe can deal with. Of course, that does mean they're a little heavier, so definitely leave them at home if pace is on your agenda. If, however, it's raining and muddy, they're tough to beat! Verdict: A shoe best for fast hiking – not out-and-out running. a favourite with trail racers. With a 10mm drop, they’ll suit those who shy away from the minimalist style of shoe. Verdict: Great for racing and training on trails. Designed for alpine-style trail runs and sky marathons, the Neutron 2 feels much more at home on rocky paths compared to muddy, twisty single-track due to its reasonably wide forefoot, designed to give more comfort on longer runs. The Vibram sole means you get a decent level of grip on wet rock and the overall feel on technical loose rock is one of confidence. The most expensive, and the heaviest, shoe on test, the Neutron 2 has a smooth, decently cushioned ride. The 6mm drop, while giving a good feel for the ground, also gives quite a flat ride with limited bounce. Flexibility on steep uphills is still good. Verdict: Good comfort and protection on rocky trails.